As we all know, Google like to spin their algorithmic Wheel of Fortune every once in a while to remind us that nobody is safe from the search engine wrath. In an effort to deliver the best possible search results to their users, Google’s team of experts often shake things up to stop people from gaming the system. Businesses will want potential customers to find them when they’re searching for a service, but Google really wants to take them to the best resource. Whether the two are the same thing – well that’s another debate entirely! Google Penguin was first seen in April of last year, making its way throughout the online landscape and punishing websites which have been indulging in ‘Black Hat’ SEO and trying to over-optimise. The real sting in Penguin’s tail was that it put paid to many modern SEO practices that had previously been used for the benefit of rankings – but are now providing a hindrance. We could write a tome on how to recover from Penguin and what to do to avoid future penalties – but it all boils down to sensibility, ethical link building and a fair playing field. Google released this algorithm update in an effort to counter spam and over-optimisation, giving websites with genuine quality a chance to succeed. Five years ago – it was all about the number of links your website has. Today – it’s about quality. Avoid the excessive link building techniques such as mass directory submissions and social bookmarking. These have been painted with the tar brush by Google and there are only a select few channels in each method that are still seen to have some authority. Great websites attract links naturally, so focus on improving the content and calibre of your website rather than forcing links into it. Mentioning ‘cheap power tools’ on every page of your hardware website won’t do the trick any more. The Google Bot is intelligent and comprehensive, it will crawl your pages at lightning speed and pick up on your efforts to influence it. Avoid building links with exact match anchor texts which mirror the terms you want to rank for and impress a ‘natural’ personality to your website. Concentrate on delivering service and knowledge to your customers – not to Google. 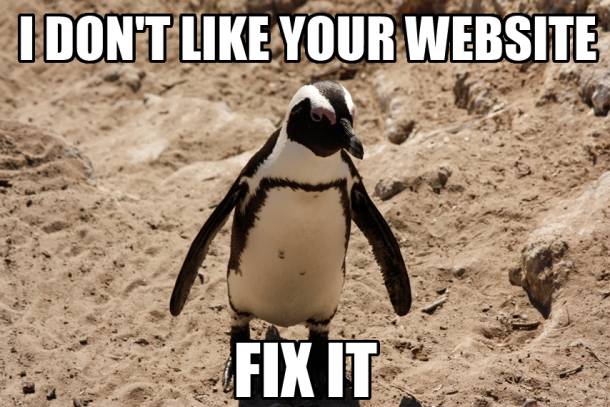 Google released the ‘Google Disavow Tool‘ to help websites recover from their Penguin update. It gives you a second chance on your back link profile – instructing Google to ignore those links that you had built hurriedly and without thought in the past. Work through your links and identify those which have little or no value. Try to remove these and if you cannot, disavow them. Digital marketing, SEO, search marketing – it’s all about social & content. Google is moving toward these with increasingly larger strides, so it’s time for the rest of us to take notice too. Concentrate on setting up quality Facebook, Twitter, LinkedIn and Google+ pages – linking them to your website and to your content. Link them to quality content. That doesn’t just mean writing helpful articles, but also other multimedia including videos, images, infographics and more. This is what is going to attract those natural links that we’re always chasing so much.